Includes reclining sofa and loveseat. Now at RC Willey, this carbon gray reclining living room set offers a relaxed contemporary vibe that your family will love. Its durable upholstery and handsome silhouette add to its chic appeal. Both pieces feature the amazing comfort and allure of reclining mechanisms and the loveseat features a convenient console with 2 cup holders! This carbon gray reclining sofa offers a relaxed contemporary vibe that your family will love. Its durable upholstery and handsome silhouette add to its chic appeal. It has a handy drop-tray with two cup holders so you can sit in comfort for hours catching up on work or simply relaxing. Durable upholstery and a handsome silhouette add to the chic appeal of this carbon gray reclining loveseat available now at RC Willey. It offers a relaxed contemporary vibe that your family will love. Featuring a convenient console with storage and two cupholders, it'll become a favorite seat in the house. 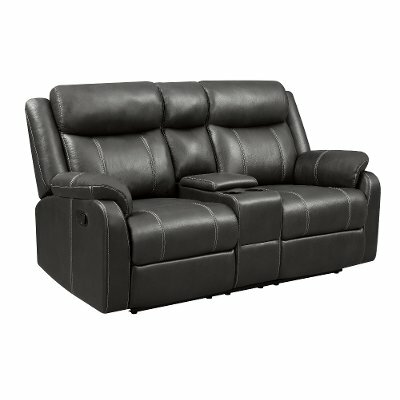 Wall Proximity for Full Recline 4"-6"
Valor Carbon Gray Reclining Living Room Set - Domino is rated 4.5 out of 5 by 14. Rated 5 out of 5 by Jess88 Love this sofa set! I love my new couch and love seat! They are so comfortable to sit or lay on. The cup holders are the best. I would recommend this set to anyone! Rated 5 out of 5 by FoxTM4 Great sofa set Love the couches. Look great and are very comfy and soft. Awesome for the price. No complaints so far after a week. Rated 4 out of 5 by Ironosity Great couch set Love the look, love the fabric. Haven't had it long enough to comment on longevity. 1 star docked for consistency in build. There are just a few things that take away from the uniformity in the overall look, minor details, like extra bulges where the ends are obviously hiding extra fabric and the fact that the back fabric with velcro on the bottom wont' stay on, causing the back cover to kind of drape down against the wall. Not a huge deal and if it weren't' against the wall maybe I'd find it can be stretched and it would stay. Rated 4 out of 5 by Snowman19 Great for family movie night This set is formal enough to go in the front room but casual and durable enough to endure the family room. The leather is a nice breathable thickness. The couch's combination of recliners and a folding middle cushion that turns into a drink holder and snack table is a game watcher's paradise. Rated 5 out of 5 by HENRY33 FURNITURE HIS FURNITURE IS SOFT AND COMFORTABLE AND EASY TO CLEAN AND HAS A NICE COLOR. I WILL TELL EVERYONE TO BUT THIS SOFA AND . YOU CANNOT BEAT THE PRICE FOR WHAT YOU GET SOFA AND LOVE SEAT. YOU CANNOT BEAT THE PRICE FOR BOTHE PIECES. I ALWAY SHOP AT RC WILEYS IT IS A GREAT STORE. Rated 5 out of 5 by Nicerc Has great features Really love this set, the bonus of having storage as well as a place to place your drinks is really great. Looks very nice and classy. Quality is great as well. 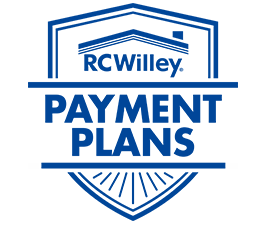 Rated 4 out of 5 by elmerslc Affordable couch For the price, you are getting a great deal. I wish the seats were deepera and the foot rest a little longer. Rated 4 out of 5 by Couchsitter Basement couches Finished our basement and needed some decent couches that would hold up well. Rated 5 out of 5 by TeeeeB Couches Great couches, love the colors. Both of them recline , the 3seat one has a hand rest you can pull down if needed. Rated 5 out of 5 by Tony11 Awesome couches Very comfortable couches and look great. The couches are great for any living room. 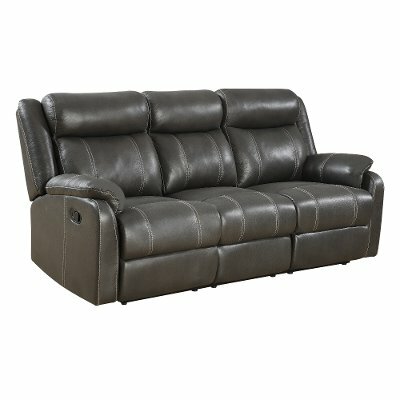 Rated 4 out of 5 by sushr recliing is all of them I really love the fact that this product has reclining feature on all of them - love seat, sofa and the main recliner. All for a great price. A couple of comments for improvements: 1) its bit heavier so making is a bit lighter would help, 2) the sofa looks to be its dusted but its not... any reason why that is? Rated 4 out of 5 by Weeg Sofa and loveseat Recliner functions smoothly and is quite comfortable. They look good and we're an overall good value.